P. told me “Mais ce n’est pas l’été” (it is not summer) when I brought the appetizer to the table, to which I had to inquire what he actually meant. “Comment cela ?”, I then said. “Well, isn’t this appetizer more a dish you would eat in summer?”, he responded. “Ah mais alors, il est difficile !” (so he is difficult!) I thought. He quickly changed his mind. Well yes, maybe the flavors in this appetizer look more on the refreshing side, zesty for sure, but to me, kiwis and grapefruit have always been winter fruit. End of story. I do not know whether it is only constructed in my head, but as a kid, we would always replenish on these fruit when colder days arrived. Every morning, we would eat a kiwi or half of a grapefruit at breakfast, making sure to get the healthy well-needed Vitamin C to fight bad winter viruses. Rare were the times when we bought or ate these fruit during the summer, perhaps also because of the large variety of available seasonal fruit such as berries and plums. So many of them! I had this idea to make a refreshing appetizer to savor to start a meal on a light note, and to be one of these foods you eat in order to open your appetite. Any lemony fruity food has this effect on me. In many ways, I also think that this appetizer is pretty festive, of the kind you would serve for meals of the end of year holidays. Besides the kiwis and grapefruit, I added a touch of red with pomegranate — which I must admit I am pretty much in love these days — , fresh crab meat , ginger and lime . I don’t know about you, but I rarely resist this type of food combination. And despite P.’s initial reaction, we both agreed that this appetizer was what is needed to cleanse one’s palate to start a meal. We always need this type of food, don’t you think? Peel the kiwis and dice them. Peel the grapefruit and remove any white parts. Dice it as well. 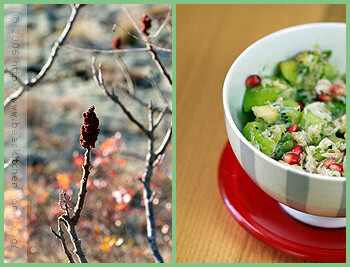 Take the seeds out of the pomegranate and place them in a bowl with the kiwis and grapefruit. Chop the coriander and mix it in. Add the crab and mix gently. Peel the ginger and grate it very thinly. 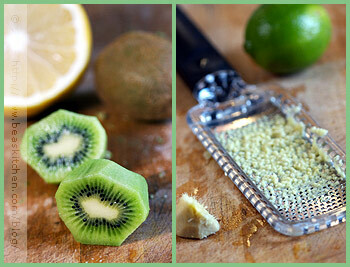 Grate the zest of 1 lime and squeeze the juice of the lime. In a bowl, mix together salt, pepper, the lime juice and zest, ginger, the Piment d’Espelette and the avocado oil. 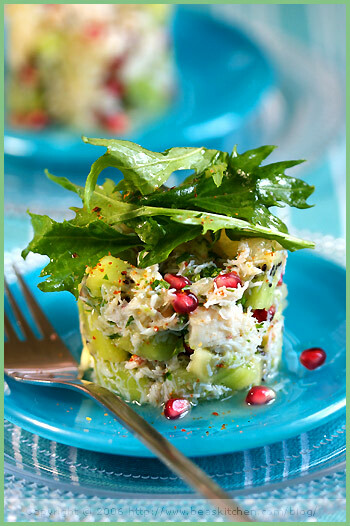 When you are ready to serve, season the crab preparation with this dressing. You can serve this appetizer as is on plates, or use ring molds to make a more elegant presentation. Top the appetizers with the seasoned fresh mesclun salad. Pelez les kiwis et coupes les en petits dés. Pelez le pamplemousse à vif, en prêtant attention à retirer toute la peau blanche. Coupez les quartiers en petits dés. Sortez les graines de la grenade et mettez-les dans un bol avec les dés de kiwi et de pamplemousse. Hachez la coriandre et ajoutez-la. Ajoutez la chair de crabe et mélangez délicatement. Pelez le gingembre et rapez-le très finement. Prélevez le zeste d’un citron vert et rapez-le également. Pressez le jus d’1 citron vert. Dans un bol, mélangez du sel, du poivre, le jus de citron vertet son zeste, le gingembre, le piment d’Espelette et l’huile d’avocat. Assaisonnez le mélange de fruits et de crabe avec cette vinaigrette au moment de servir. Servez cette salade fraîche sur assiette ou utilisez des cercles pour une présentation plus élegante. Garnissez cette entrée avec les pousses de salade assaisonnées. De bons ingrédients et une association originale : j’aime ! Très belle idée et toujours très jolies photos ! 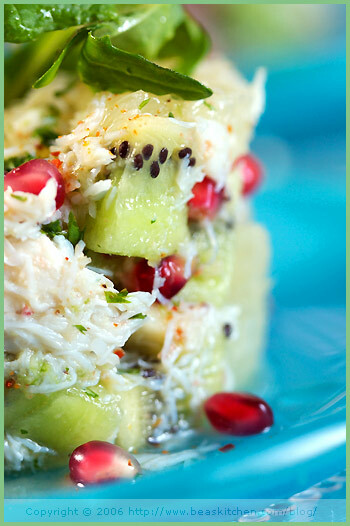 I never knew kiwi and crab could go well together. What an imaginitive dish! Original et délicieux, je retiens cette recette de plus c’est super beau!! I love the presentation! Perfect for any season! Amazing! Beautiful… like always… And fresh. Quelles couleurs! C’est bien l’été dans l’assiète, si ce n’est dehors! Très beau! Just lovely: some times I wonder if you’ll run out of ideas. Now I know: never! Béa, I never worry that you will run out of ideas any more than I worry that you or I will not want to eat another meal. Tell me, your ideas you just let it happen, right? Sometimes I think maybe I won’t be dropping my jaw when I open your page…this was not one of those times. My jaw just kept dropping as I read the ingredient list. This is beautiful!!! I am so happy you are here. Beautiful recipe and presentation. I’m with you… citrus, kiwi and pomegranite are winter fruits in my book too! Que c’est original ! les ingrédients me plaisent beaucoup et la présentation est magnifique. Je retiens ! Ginger + lime + crabmeat sure is a classic! Fantastic photos as usual (esp blue color… I’m dazzling! ), I also fall in love your step-by-step photos, very home-feel, very warm! le kiwi apporte la touche innovante, bonne idée ! la photo est sublime on croquerait dedans sans vergogne! J’en prendrais bien sans les kiwis, mais ce ne serait plus tout à fait la même chose. C’est presque japonais comme présentation, très esthétique. Je trouve cette entrée, géniale des fruits un peu acidulés, c’est une excellente idée ! What a beautiful salad. I love any salad stacked up like that! I am a big fan of cold crab. Oh my goodness! How do manage to consistantly produce these fabulous dishes almost everyday! It’s mindboggling. (We’re all so glad that you do!) Beautiful! this sounds so nice and refreshing! Very nice ingredients in this recipe. Ca c’est le genre de plat que j’adore manger quand je suis toute seule! J’adore la luminosite de tes photos. I think it looks divine! And I agree it would be a wonderful and cool way to start a meal, especially if the rest of the meal has more Autumn-like flavours. As always, the picture is so beautiful! wow, your salad looks and sound very appetising! i love the blue plate! superbe! C’est très original et ça a vraiment l’air délicieux! Can I tell you how much I enjoy just viewing your posts? They always leave me hungry, even when I have just eaten! I was wondering if there’s anything substantial that you could substitute for the crabmeat. Unfortunately, shellfish can set off a migraine attack for me, so I have to avoid it. 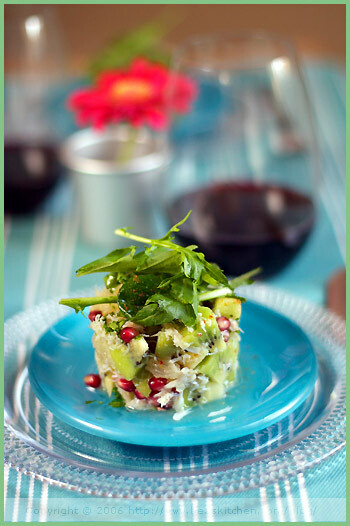 However, I love the fact that this appetizer mixes both fruit and veggies in such a charming manner. C’est noté, admiré, enregistré et bientot testé ! Just the kind of appetizer I’d want to have in winter — to remind me of summer. And I’d want your gorgeous photos to go with it! Delicious! It’s amazing for the eye and for the taste! Bravo! Think I’ll give this one a whirl! The inclusion of pomegranate seeds is ingenious! The pomegranete has become a firm favorite of mine recently. Looks luscious, love the colours and naturally the flavours…Mmmm! Annellénor, merci beaucoup de ton passage. Contente que la recette te plaise. Jeff, you are funny! Really? I woul not even have thought about this at all! Ester, encore plus contente alors sachant que tu es fan de grenade. Geneve, thanks. Sweet of you! ALanna, ahahh. Well, I am sure I have moments when I see a blank, but true, they are rare. Tanna, oh you are such a cutie to write this note. I hope I will never have the bad experience to disappoint you then! Thanks for your words. L, thanks. I am glad to hear you agree with me. I will let P. know I am not alone to think so. Gattina, yes a nice classic, isn’t it? Thanks for your note. Happy to read you like the getting into the food steps. Gracianne, ah tu es bien la première que je connais qui n’aime pas les kiwis, comme quoi, il faut des goûts pour tout le monde. Peabody, thanks. Glad you like it. Crab is nice, isn’t it? Sher, I love your word “mindblogging”. It is very cute! Kat and Krista, thanks to you both. Helen, ah bon alors ta petite famille n’aimerait pas? Merci de ton mot. Scott, thanks. Mind you, it is so sunny and warm outside today, unreal for the season! Ivonne, thank you my dear. Rose, I have been trying to think of a substitute for crab but mmm, not sure. Let’s see, maybe add more greens but do not serve it as a stack. Marinated raw fennel would be nice in it too I sense. Thanks so much for your note. Come back often! Entre amis, merci. J’espère que tu aimeras! Kim, ah yes I know you are not the best friend with fruit. ANd I know you like the summer feel of it, you are a summer girl! Lucy, thanks, I think so too. Rowena, of course, you are my seafood reference. I want to see more shells on your blog. Come on, bring them on! Chris, thanks so much for your note. Welcome and hope to see you around soon again! Natalie, easy to make, try! Esther, thanks. I hope you like it. Katie, thanks. Pomegranate is a great fruit indeed. Bron, thanks my dear, once more. Just gorgeous. Wouldn’t this be perfect as a Christmas dinner starter? Bon jour! I love your blog. Where do you get your little spring form pans or molds? I love the way it looks and this recipe is a must for me to try! alors là je suis séduite, j’adore déjà la présentation sans parler de sa composition, je prends note !!! !